mm244: Solar power – finally ready for prime time? Left-Handed Complement has covered alternative energy several times (here, here, here and here for example). What we haven’t discussed is solar power; it has always seemed attractive, but impractical. Two articles found today, via Digg.com (seems to be somewhat more mainstream these days) and always dependable reddit.com, both from sites new to this reader, has us reconsidering the viability of solar power. Until a few years ago the suggestion that solar power might provide the answer to the intertwined problems of long term energy security and climate change would have been dismissed as a pipedream. The high cost of solar cells, their inefficiency in converting the sun’s rays into electricity and the lack of state investment or assistance for renewable energy start-ups meant there was little hope. But now, thanks to some determined innovators, the rising cost of fossil fuels and the widespread realization about the damage they cause and some clever market regulation, a solar transition is rapidly become a reality. It’s impossible now to underestimate the need for alternatives to fossil fuels for central power generation. Germany is one nation that has created laws mandating that a certain amount of power be generated via solar, and as a result, prices are finally coming down, as the profit motive supports research. Innovations in technology have taken solar power out of the toy stage (see below) and into becoming a more realistic alternative. There are also still a plethora of technical issues to overcome. Firstly, new research has shown that the small windmills and solar panels that are fitted to our rooftops often create more greenhouse emissions during manufacture than their use curtails. Secondly, how do we store the energy solar power creates for a rainy day? Hydrogen is notoriously dangerous to transport and there are huge inefficiencies when you start converting and moving energy about. Which brings us to the second article of the day, from another until now unknown to us source. 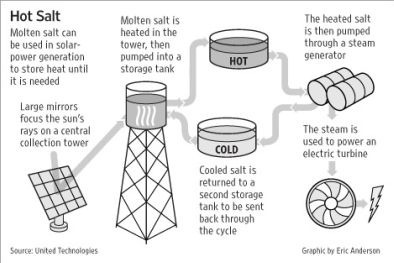 “The molten salt holds its heat very efficiently and for long periods of time,” Dan Coulom a spokesman at Hamilton Sundstrand. Coulum said the company plans to build as many as 10 plants over the next 10 to 15 years, pulling in revenues of $1 billion over that time period. The story provides a handy diagram that illustrates the technology. Thus we have both ends of the puzzle: more efficient (40% solar conversion instead of today’s common 5%) and as a result less expensive generation; and a reasonably efficient method of storing solar energy while the sun isn’t shining, mainly at night. MUDGE remembers visiting as a young child the now restored to sublimity Museum of Science and Industry in Chicago, that artifact of the Columbian Exhibition of 1892-3 and wellspring of dreams for generations of Midwestern children (and worthy of its own post or two). We marveled over the small, tucked away solar power demonstration (massively overshadowed by the incredible theme-park like coal mine — what a fabulous museum, and how ahead of its time!). It was a light-bulb like globe containing a four-bladed weather vane whose fins were coated with a photovoltaic material. Placed near a light source (a real light bulb), the vane spun and spun. Seemed like science fiction, but it turns out that Crookes radiometers have been around for over 130 years. And, they’re still available today. Sort of amazing that the kid’s toy of 50 years ago has grown into the capability to provide at a reasonable monetary and favorable environmental cost the centralized power our planet desperately requires. Wind, water, solar, even (wash MUDGE’s mouth out with soap!) nuclear power — the world needs all of those alternatives to coal and petroleum, and now! Note! : the link to sundancesolar.com used above is for the convenience of faithful reader and represents no commercial relationship whatsoever. Left-Handed Complement should be so fortunate as to ever collect remuneration of any kind for this endeavor. I can link, so I link. It’s technology. It’s cool. It’s an artifact of Sequitur Service©. Deal with it. This entry was posted on Saturday, January 5th, 2008 at 4:51 pm and is filed under Environment, musings, Science, Technology. You can follow any responses to this entry through the RSS 2.0 feed. You can leave a response, or trackback from your own site. 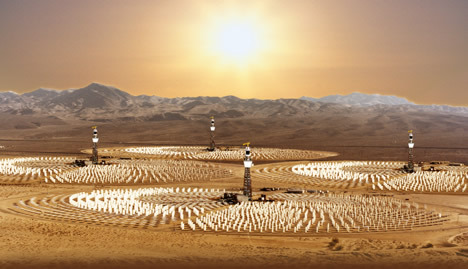 5 Responses to mm244: Solar power – finally ready for prime time? Nor I, really, before I tackled the topic. Thanks for stopping; I am really enjoying your blog: http://nursemyra.wordpress.com/ . Hello! Have been looking into renewable energy sources that i can just setup at home, and solar energy was a definitely on my checklist. The post is just making me want to get some small solar panel systems installed on my roof so bad. I initially planned to buy them, but they are quite expensive at the moment, think im gonna look up a way to build some cells at home and give em a whirl. Well, thanks again for the post, really good insight into this area. Freeline skates are awesome to do tricks on.you should Definatly get a pair!